2. Hysteroscopy: hysteroscopy can not only observe the uterine cavity, but also the carotid canal, especially with the application of microscopic hysteroscopy, observation can be more detailed. 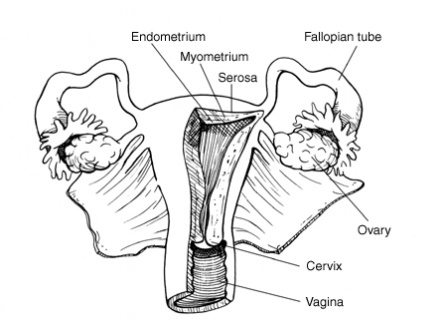 With hysteroscopy, doctors can directly observe the tumor site, size and judge whether the boundary is limitative or disseminated; whether it is exogenous or endogenous type; whether cervical canal has been affected or not. It can directly get suspicious lesions of the living tissue under the guidance of hysteroscopy and sent it for histopathological examination, besides, the accuracy of hysteroscopy on diagnosing endometrial cancer amounts to 94%. 3. Uterine cavity pipette：Apply specially-made uterine cavity sipper or brush to place inside the uterine cavity and take suction of secretions for cytological examination, or for screening. 4. B ultrasound examination: B ultrasound examination is one of the routine examination of endometrial cancer; uterine ultrasonography has certain significance in uterine cavity size, location of endometrial cancer, and in whether the tumor has penetrated through the uterine serosa or involved the cervical canal; especially has a certain reference value in the understanding of myometrial invasion and clinical staging area. 5. Retroperitoneal lymphography: it can determine whether there is pelvic and para-aortic lymph node metastasis, so that facilitate treatment options determination. 6. CT scan: computed tomography (CT) has a certain meaning on endometrial cancer diagnosis as CT scanning image features clear and can accurately delineate the fine structure of tissue, tumor size, scope. CT may also determine the surrounding connective tissue of uterine tumor, pelvic and para-aortic lymph nodes and pelvic wall, peritoneal metastatic nodules. Cancer experts of Modern Cancer Hospital Guangzhou remind: if diagnosed with endometrial cancer, patients should promptly go to the regular hospital for treatments.